Providing complete resilience for sensitive loads, the lithium-ion range benefits from a hot swappable battery design, allowing for engineering work to be quickly undertaken without the need for powering off. Taking up a proportion of the space of conventional UPS systems when comparing like for like on battery runtime, the extended lithium-ion battery life means that these systems offer three times the energy density and double the expected design life when compared to traditional VRLA (Valve Regulated Lead Acid) batteries. Designed to not only provide extensive performance benefits these lithium-ion solutions also come with leading edge operational features, which include programmable outlets, allocating less essential load to the critical load in an external mains outage. Commenting on this latest technology, CertaUPS’s product manager, Matthew Wright said: “CertaUPS is committed to being ahead of the curve and this is a very exciting addition to our product portfolio. We are one of the first UPS manufacturers to bring the lithium-ion UPS technology to the UK market and we have already received considerable interest. “Although lithium-ion technology has a higher initial cost, when considering the long term Total Cost of Ownership (TCO) these UPS solutions tick all the boxes from design through to reliability. They are smaller, lighter, offer longer life, improved power density and require significantly less maintenance. 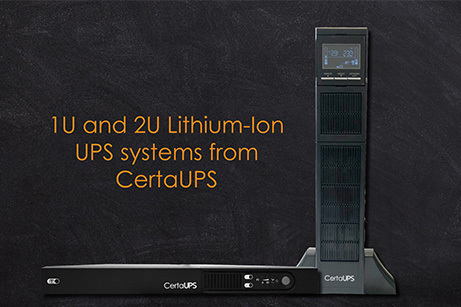 CertaUPS emergency power solutions are among the most highly sought after across all industry sectors including healthcare, councils, IT and data centres. For further information, and to view the complete CertaUPS product portfolio please visit www.certaups.com, email info@certaups.com or call 03333 130 351. You can also find out more by visiting our stand, M294, at IP EXPO Manchester from the 3rd-4th April 2019.